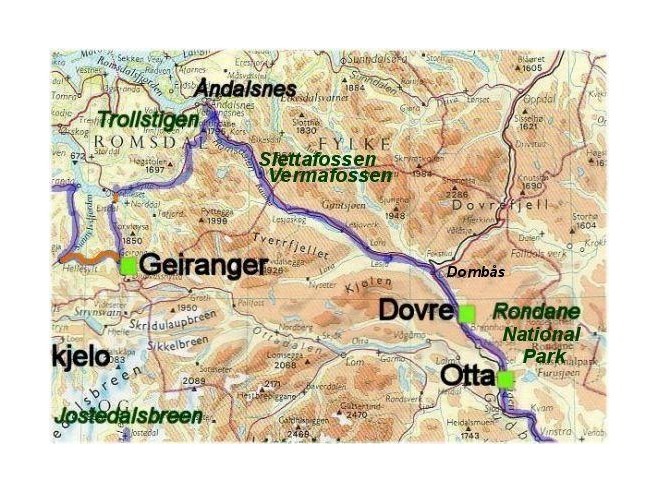 Today's journey will start of with a trip along the E136 through the Romsdal valley. 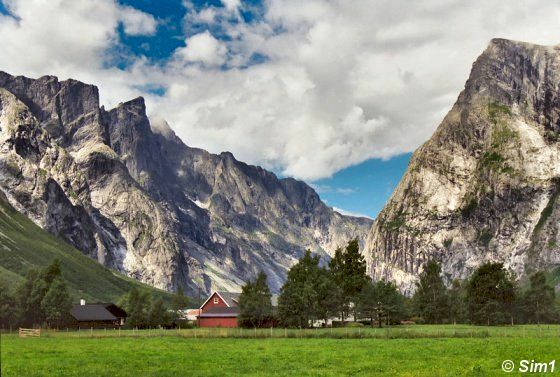 This is a 105 km trip from Dovre (close to Dombås) to Åndalsnes, and offers some beautiful scenery along the road. From there we will be driving up the famous Trollstigen and the end of today's journey will be at the amazingly blue and picturesque Geiranger fjord. The total trip is approximately 215 kilometres. It's time to pack up our tent again! We had a fantastic day yesterday in Rondane National Park, but today will be without a doubt just as spectacular! And it seems like we are having some luck with the weather as well. I was a bit worried as it rained during most of the evening and night, but this early this morning the skies cleared up and we even see a glimpse of sunshine. It looks like it's going to be a great day! So don't waste any more time. 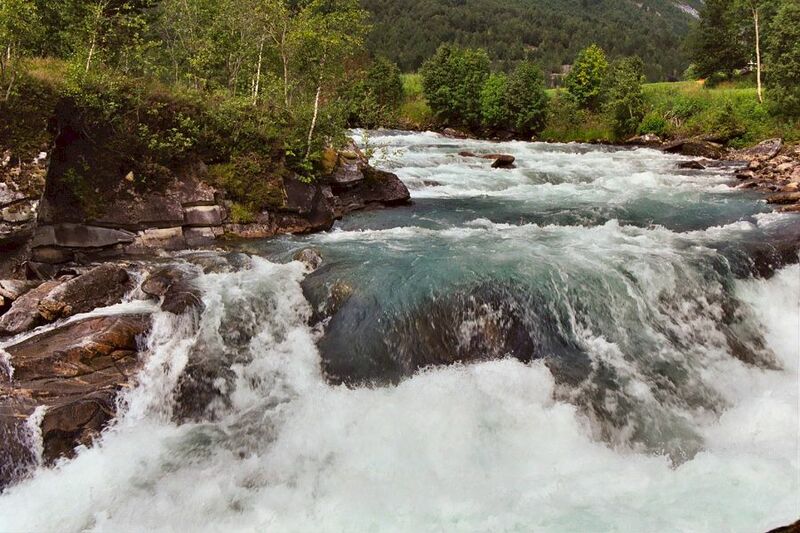 it's time to discover more of beautiful Norway! Our first stop is at Vermafossen. We found this fantastic waterfall by luck actually. Through the trees I spotted the waterfall and there was a parking spot on the side of the road at this point. So without hesitation we parked the car and tried to get a glimpse of the waterfall. A small trail brought us to a lookout point where we could see the waterfall in the distance. At this point in the river two waterfalls seemed to meet. The first one was wide, and it is part of the river rushing down. 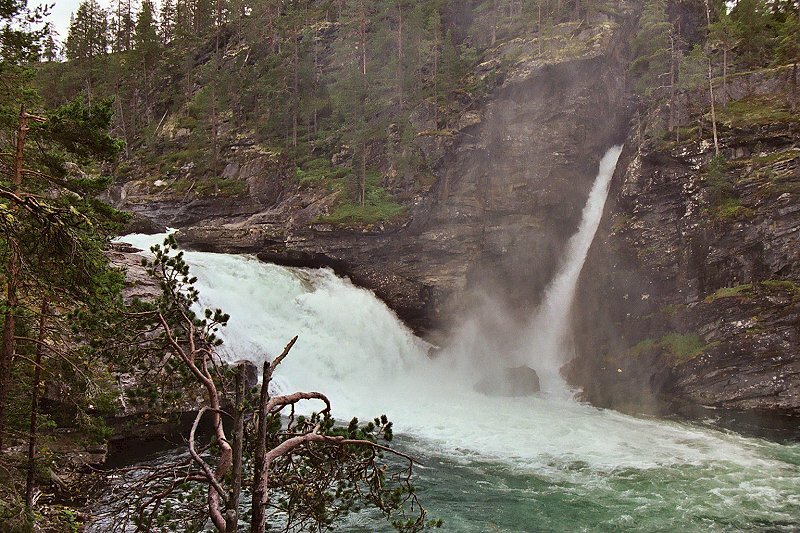 The second waterfall was smaller and coming from high up the mountain adding more water to the already wild river. The view from the top of the slope was nice, but I wanted to have a closer look at this beautiful Vermafossen waterfall. That wasn't easy though as there was no real trail going down the slope. But that wouldn't stop us! Hahaha, Åke and I tried to make our own way down, and we succeeded to our joy. The path was steep at points, but never too steep, and there some bushes and scrubs in the way, but those didn't make too much of an obstacle either. So with some effort we were able to walk down and got to a nice lookout point, were we could had a great view over the waterfall. This point at the river was just fantastic to see. Not only there were those two great waterfalls, but also the river continued its way in full force. 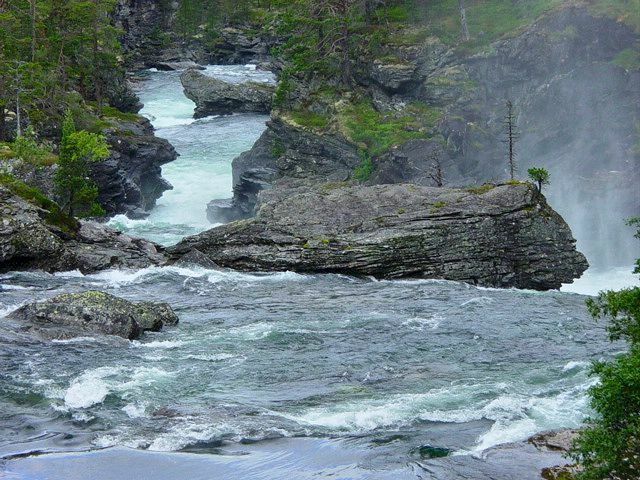 The rocks weren't a problem for the river as it cuts its way through there with so much power. And the trees looked more like little sticks than full-grown trees. All in all it is an impressive landscape to look at. The next waterfall we made a stop at was Slettafossen, close to the village of Verma. 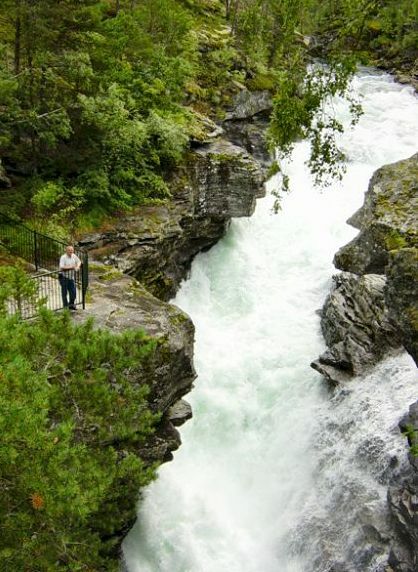 Here the river Rauma runs trough a 30 to 40 metres deep gorge. There is a bridge crossing the river at this point. I am leaning over the bridge to have a good look at the falls and while doing that took this picture. You can get closer to the falls by taking some stairs that bring you to a lower level. Fences protect you from getting too close the falls and falling into the gorge. On the left hand side you can see Åke relaxing leaning against the fence taking in the view over the wild river. These falls are much easier to reach than the previous one, but that also has made them very touristy and to me less enjoyable. Across the bridge is a little souvenir shop offering you everything from images of the falls to little trolls. The closer I got to Åndalsnes the spectacular the landscape became. The wide valley became smaller and smaller, ending in only a narrow passage. The mountains became much higher and steeper as well, and everywhere I looked there were waterfalls. It is really an amazing thing to see! Hahaha, one thing made me really laugh though! Only a few days prior to my trip to Norway I made a lot of effort to visit the highest waterfall in Sweden. Sigh. I wonder why I did that?! 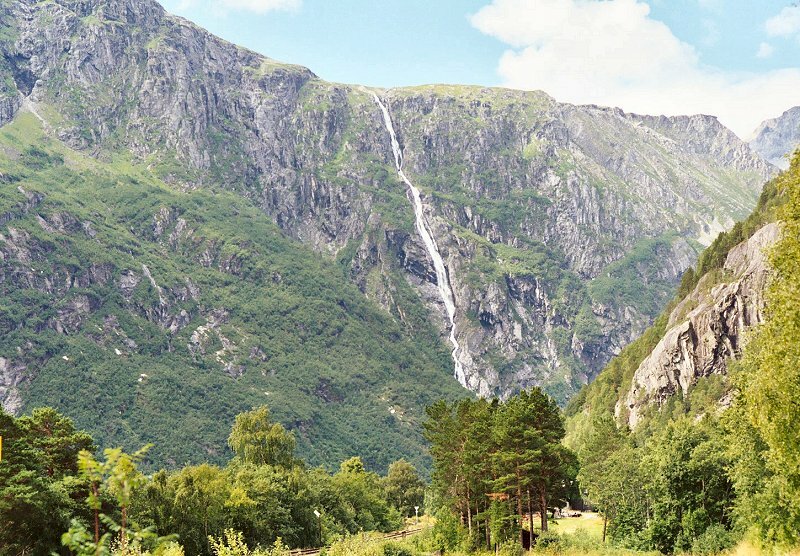 The highest Swedish waterfall is very modest compared to all the waterfalls I saw here in Norway! Sometimes pictures speak for themselves, and this is one of them. What can I add more to a picture like this; the natural beauty of the landscape is more than obvious. The green valley, the steep walls of the bare mountains.... Sigh, Norway is so beautiful! 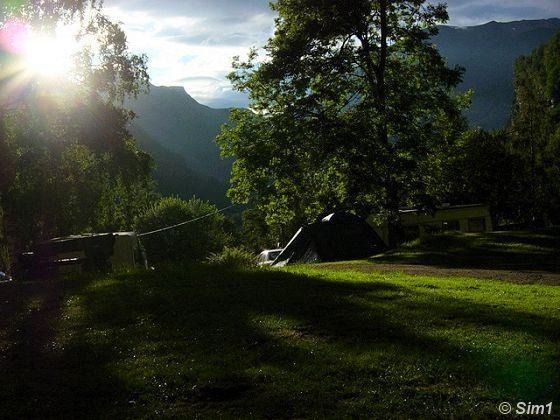 In the early afternoon I arrived in Åndalsnes. There isn't that much to see or do in this town itself, but the surrounding area makes up for that. The surroundings (as you can see on the tips about this area) is amazing. Maybe Åndalses itself is not so spectacular, but it is a convenient place to stop and have lunch. So that's what we did! I had a great tasting vegetarian pizza, hahaha, maybe not the 'typical' Norwegian food, but great to have for a change. 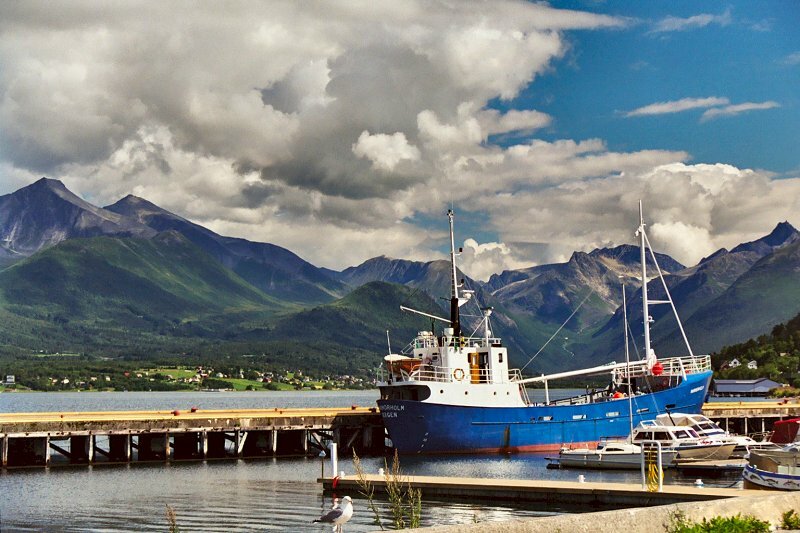 The one thing I really enjoyed in Åndalsnes was a walk along the harbour area. 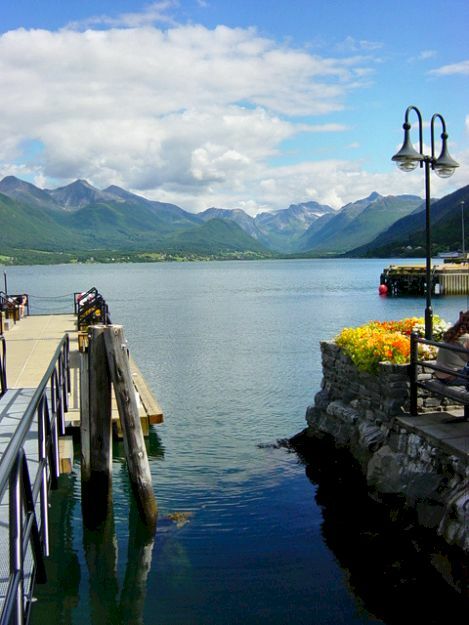 From here you have a wonderful view over the surrounding mountains and the blue-coloured fjord. 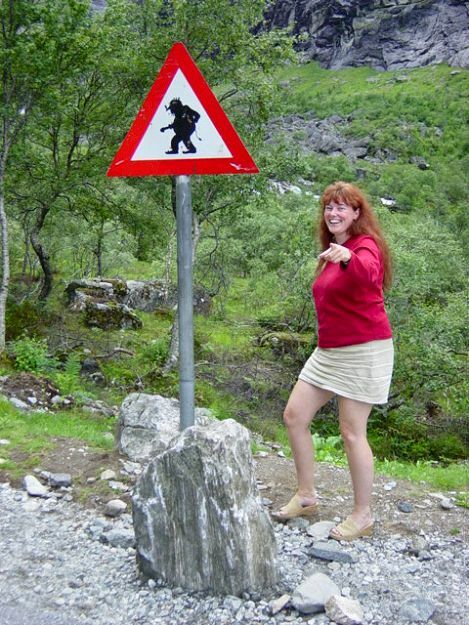 I found this troll-warning sign at the beginning of the famous road 'Trollstigen', hahaha, and it made me laugh so much! They actually have a road sign for them! lol :-))) But more about those 'famous' Norwegian creatures in a next tip. Now it is time to drive up the 'Trollstigen'. I am standing here at the beginning of the 'Trollstigen'. This impressive road close to Åndalsnes is not really visible from this view. But I guess that's kind of nice, because this way you'll be surprised with the view by every corner in the road you take, whilst driving up the mountain. I was a bit nervous going up this road, as it is narrow and has many hairpins before you get to the top. There is not much room in this valley, so there isn't that much room for a road! And as 'Trollstigen' is one of the most visited tourist attractions in Norway, it can be quite busy with cars and that doesn't make driving here any easier. It is not really a road for those who are afraid of heights. And 'really' not a road when you have a caravan with you! Of course it is possible, but it won't be an easy drive. There are 11 hairpin bends in total and the road has an incline of 9%, with open drops on the side. Remember the bridge in the previous picture? Well, that's where I am right now. At the bridge you can take a better look at the 'Stigfoss'. 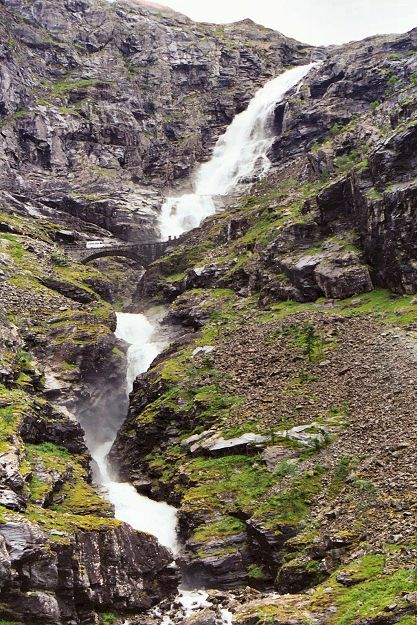 This is the waterfall that thunders down this valley and crossed the 'Trollstigen' road. In the picture you can only see the upper part of the waterfall, as the waterfall continues to roar down under the road and down into the valley. The bridge over the waterfall is from 1935. Wow, what a view! 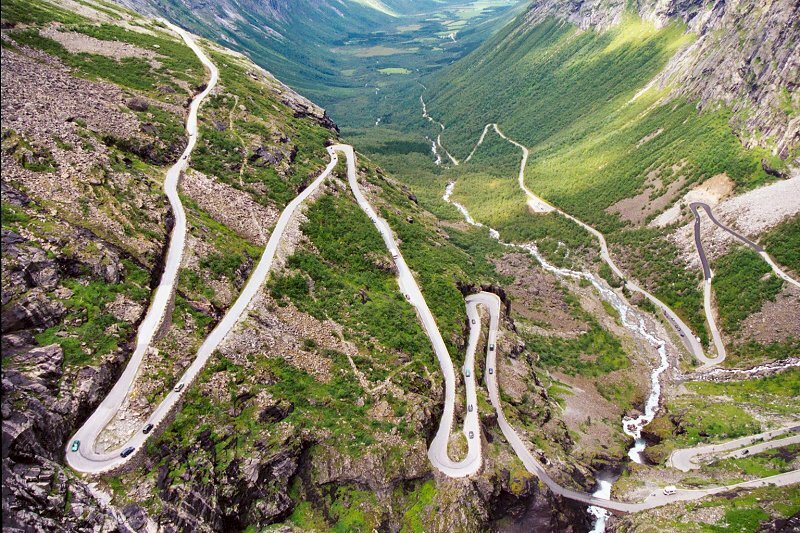 This is the Trollstigen! 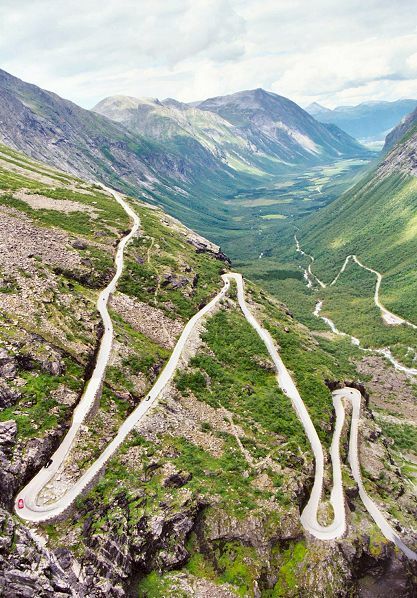 Driving up the Trollstigen (The Trolls' Path) is well worth the trip! Wow, the view is so breathtaking!!! When you drive up the mountain, the view gets more and more spectacular with every corner that you take. This picture was taken from the top. There is a great viewpoint here, not a long walk from the road. So do get out of your car, stretch your legs, walk the little trail to the viewpoint and just be amazed by what you see! If you look good at the picture you can see all the 'miniature' cars on the road, the bridge over Stigfoss waterfall, and of course the fantastic view from here! The 'Trollstigen' has always been an important connecting routes between Sunnmøre to Romsdal. The original route was not this road, but a narrow horse trail. You can still see this horse trail and the good news is that it is restored and is now used as a hiking trail. It sounds like a beautiful trail to hike, although probably very steep and exhausting to do. If you do like me and take the car instead, you might have to think about which season to travel here. During the winter to approximately the middle of May the road is closed, depending on snow conditions. On top of the 'Trollstigen' you can find some tourist shops and of course the 'obligatory' troll is sold here by the dozen. Maybe not that surprising, as this road is named after these trolls :-)) But what is a troll exactly? 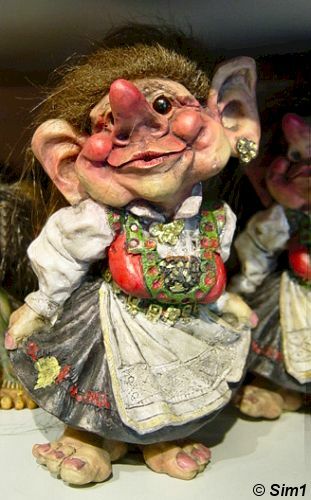 A troll is a creature that according to legends from long ago lived in the forest of Norway. People didn't know what these creatures were, but they were generally believed to have supernatural powers, and they came to be known as trolls. Trolls weren't really beautiful. They had long crooked noses, only four fingers and toes and most of them had long wild hair. A troll isn't per definition small though as many people assume. They can be small, but they can also be like giants. Although they look frightening and shaggy, they are also considered as good-natured. But it is really important not to make a troll angry or you would be in deep deep trouble! Close to the village of Heggen I saw this little waterfall. A nice spot to get out of the stretch your legs after a long drive and admire the landscape. 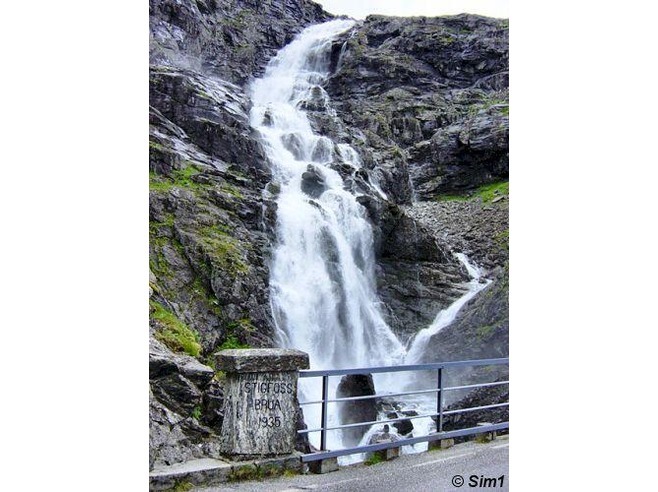 Heggen is located approximately 15 minutes before you get to the ferry to Geiranger (ferry from Linge to Eidsdal). This is the first ferry trip on our journey through Norway, the first of many more to come. I was surprised by the ferry system though, it is very efficient and only on a few occasions I had to wait for a long time for the ferry. The costs will add up though if you go ferry hopping with a car too much, but it is also fun to make these short trips crossing the beautiful fjords. 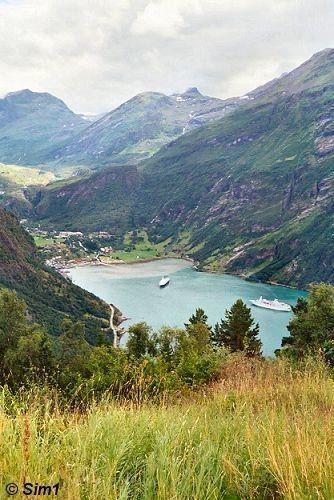 This is the ferry connecting the Trollstigen to Geiranger. The ferry goes from Linge to Eidsdal. 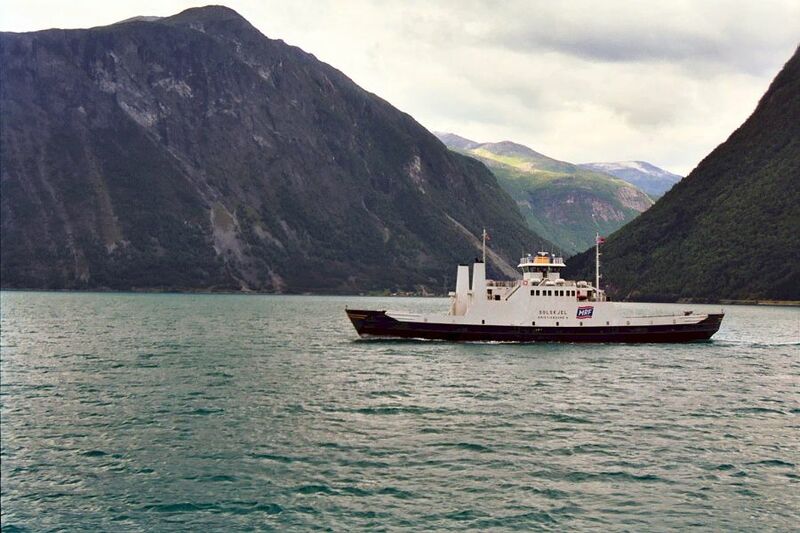 The ferry crosses the fjord around 40 times a day during the summer season (beginning of June to the end of August). It is a very short crossing, it only takes 10 minutes to get to the other side. A car including driver will cost you 43 NOK and a passenger 18 NOK (prices 2003). We arrived at the Geiranger fjord from the north side. Here you descend down to the valley on the Ørneveien (Eagles way). There are a few viewpoints along this road and wow those views are fantastic! They certainly are a 'must-stop'! 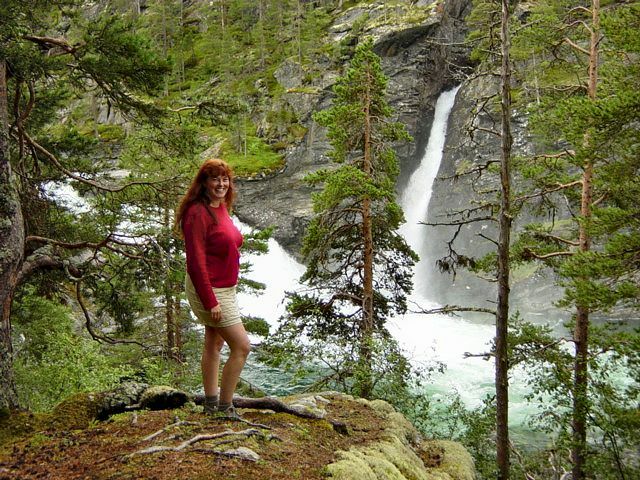 I was amazed by the view : the wonderful blue coloured-water of the fjord itself, the high steep walls on the sides of the fjords and far in the distance I could see some of the fantastic waterfalls along the fjord. And of course there were a lots of boats going up and down the fjord, as seeing the fjord from the water is a wonderful experience. But I'll tell and show you more about that on my Geiranger page. 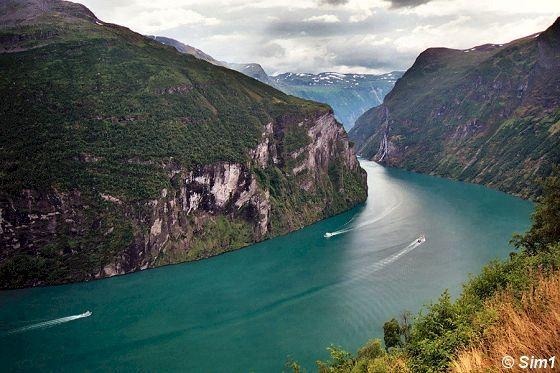 Geiranger with is beautiful fjord is located 427 kilometres from Oslo and 373 kilometres from Bergen. This is another view from the Ørneveien (Eagles way), not as good as the other one, hahaha, but it is still great one! In the distance you can see the village of Geiranger, which is located at the end of the fjord. Geiranger village is the destination for many tourists as this is the place where you can take boat tours on the Geiranger fjord. It is time to find a campground and set up my tent. There is lots of accommodations available at Geiranger, but it is also very busy here with tourists. So finding a place to stay might be hard in high season. I was on a camping trip, so I focused myself on the campgrounds around. The ones close to Geiranger seemed to be full, but a bit up the road on the other side of Geiranger I found the perfect campground. 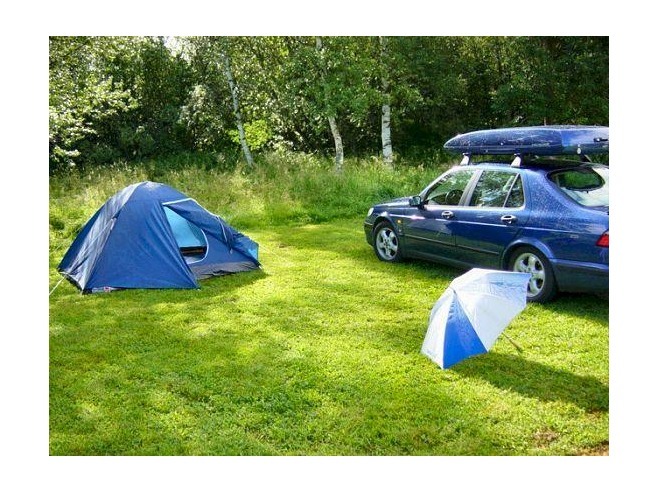 The name of the camping place was 'Vinje Camping'. It didn't rain, so I had time to put up my tent, make some dinner.... and oops..... it started to rain... arghhh! Hahaha, luckily there were some picnic tables under a roof, so I didn't mind it too much.